Happy Saint Patricks Day! 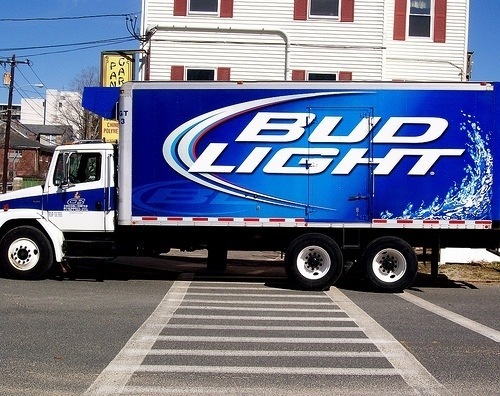 I thought I’d commemorate the great day of drunkards with a photo of a beer truck. Now, being that I’m part Irish and my Grandma pretty much celebrated this day as if it were a Federal Holiday, I’m pretty well informed on the history of the event. Like, did you know that Saint Patrick’s Day is a religious holiday celebrated to commemorate Saint Patrick. Saint Patrick is the most commonly recognized patron saints of Ireland. Saint Patrick’s Day was made an official feast day in the early 17th century and has gradually become a celebration of Irish culture in general. Now, you may be wondering why people wear green on the special occasion? Well, you may be shocked to know that the original color of Saint Patricks Day was actually blue. However, a green shamrock was a symbol that St. Patrick had used to explain the Holy Trinity to the pre-Christian Irish and people would wear a shamrock to display their faith. Green became the more popular color and has been ever since. How about why we pinch people who don’t wear green??? That whole concept is an American tradition only. People used to think that wearing green made you invisible to leprechauns, fairies, and other mythical creatures who would pinch anyone they could see. People began pinching those who didn’t wear green as a reminder that the mythical creatures would sneak up and pinch you if you didn’t wear green. So, maybe I taught you something with a fun photo today! Have a great day! Stay safe and don’t drink and drive!!!! AND did you know that St. Patrick wasn’t even Irish? He was born in Scotland! You know, my Mother told me that when I was little and my Grandmother almost flipped. She refused to believe it!